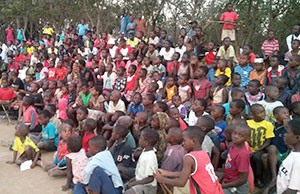 (MissionNewswire) Thanks to Salesian Missions donors, the Don Bosco Youth Center in Lilongwe, Malawi has been able to launch a program that offers counseling workshops, seminars and educational literature that addresses the multitude of challenges faced by youth in the region. The program focuses on life skills training and the avoidance of high risk behavior such as substance abuse and gang participation. The project plan is to enroll 2,500 at-risk youth in this program. The Don Bosco Youth Center campus includes facilities for youth development in sporting disciplines and features a soccer pitch and courts for basketball, netball and volleyball. Also on the campus is the Don Bosco Youth Technical Institute which offers commercial and technical courses in fashion arts and beauty, accounting, bricklaying, motor vehicle mechanics, hospitality and information and communications technology. Being able to attend school in a safe and comfortable environment is the first step to ensuring youth are able to make the most of their education. Students who complete their elementary and secondary school education are able to advance to technical skills training opportunities at Salesian centers like the Don Bosco Youth Technical Institute in Lilongwe. The new life skills training program ensures that youth are emotionally prepared for the challenges of life while helping them to make good decisions now and in the future.